We live in a world of lightning speed technological change and mass production of everything from our clothing to our food supply. In our day-to-day lives, many of us yearn for the homemade, the handmade, things that were built with care by a real person. We feel good about buying handmade art, and for good reason. The artist puts their heart into crafting each piece. There’s usually a good story behind it. A story about what inspired the artist’s journey. A story that gives you a connection to the person and to the piece. And importantly, by buying handmade art we directly support that person’s livelihood and help them to continue to create. This post highlights Paradise City artists who are each inspired by their own corner of New England. And who are from very different areas – from rural Vermont, to the Fort Point artist enclave in downtown Boston, to mid-coast Maine. These artists use hands-on techniques to craft one-of-a-kind pieces which reflect their own personal stories. You cannot get any more local and sustainable than fiber artist Hannah Regier of Sky Like Snow. 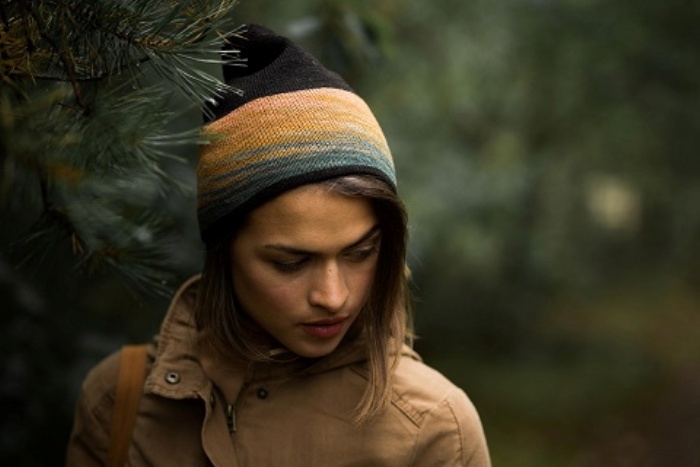 Her hats are knitted from 100% New England grown and spun wool from local alpaca and “well-loved” sheep. She creates dyes from farmed and foraged plants and mushrooms and is even experimenting with growing her own Japanese indigo. Click here for a video peak into Hannah’s world in Vermont and her creative process. All of the hats are made from wool and alpaca sourced from local shepherds and custom-spun for Sky Like Snow in a small New England mill. The dyes are extracted from plants and fungi farmed and ethically foraged from the landscape around Sky Like Snow studio. Gabrielle Schaffner, ceramic artist, is inspired by living among a community of artists in Fort Point in Boston and by her love of cooking. “I like a plate that looks good with food, a large cup to hold plenty of caffe latte, and a pitcher that doesn’t drip.” She lives with her family on A Street in Massachusetts’ first artist-owned, live/work artist cooperative. A resident of Fort Point since 1988, she served as the Executive Director of the Fort Point Arts Community from 2007 to 2014 and continues to be engaged in the community. Gabrielle’s functional pottery is handmade in porcelain, either on the potter’s wheel or by hand-building, using images often drawn from nature or archeology. Gabrielle’s designs reflect her thoughts on how her work will be used and how it will function in everyday life. She must be an amazing cook and photographer because the pictures of food on her handmade plates, bowls, and cups look delicious. Gabrielle’s donuts on her ceramic plate looked so appetizing (for a sweet freak like me) that I’m actually eating a cider donut as I’m writing this. Kathleen Buchanan is inspired by close observation of the beauty of coastal Maine – the vertical trees, the water, the wildlife, the horizon. She makes collagraph prints, for which she builds a collage of various materials representing elements of her design. Painting over the paper with acrylic gel adds texture and detail to the design. For images with multiple colors, she will build separate plates, each printed one at a time to form a combined image. I generally print my images in small editions of 20 to 30 prints. 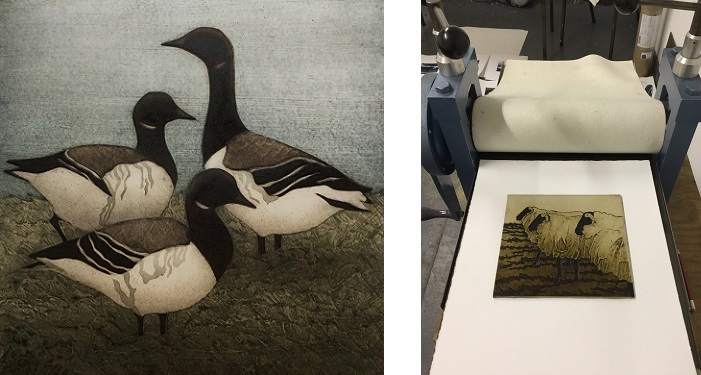 … Although there are multiple prints of the images, each print is considered an original piece of art because it is generated entirely by the artist’s hand, not by using a mechanized reproduction process. Kathleen trained and worked as a biologist – you can see the keen observation of nature in her work. She had always taken art classes throughout college. However, during her master’s program at University of Alaska, she took a printmaking course which changed the course of her career. Kathleen has set up her 400-lb. printing press in her studio in the front room of her home in Rockport, Maine. Living and working with her family among the dreamscape of coastal Maine provides a creative environment for her work. Each of these artists exhibited at Paradise City Marlborough on November 17, 18 & 19, 2017.